We get lots of questions when people are setting up the Shop Now Call to Action button. The admin in Facebook for this button is really confusing. Hopefully we can help out. 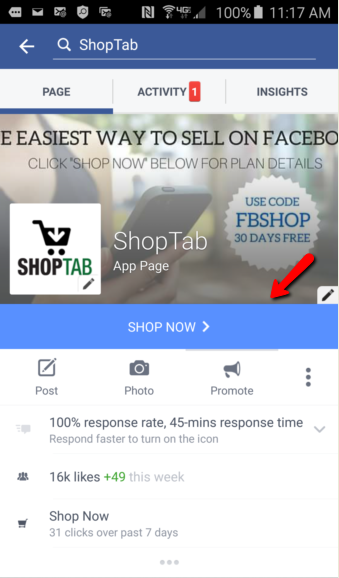 To test your button on mobile you likely click the Shop Now bar noted below. You will likely see one of the screens below. You see these because you are the admin for the page and this is Facebook's way of allowing you to make changes to the button. Only admins will see these screens, not your buyers. In the event you see the 1st screen above (no test button option), look at the image below and click the text below "Shop Now" and this is what your buyers will experience. If you see the screen on the right, click the test button. Yes, this is strange behavior but FB sets it up this way for admins, buyers just go right to your shop.